Children are introduced to reading and writing immediately upon entering our school. Our phonetic system allows even the youngest children to start sounding out words. This fosters, at a very early age, a love of the written and spoken word. The Montessori materials are also designed specifically to improve pencil grip and to strengthen the muscles of the hand which are used in writing. 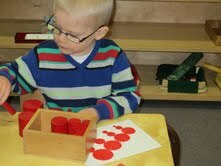 We have a very wide range of materials and exercises in our Language area and an extensive library of books. As well as helping them to read and write, we continuously enrich the children’s vocabulary by giving them precise language, introduce them to poetry and read to them. The children are taken gradually, and at their own pace, through a series of mathematics exercises which lead eventually to abstract mathematical processes. The children are prepared for mathematics through manipulation of concrete materials which permit them to internalize such abstract concepts as number, symbol, sequence, decimal system, operations (addition, subtraction, multiplication and division), memorization of basic facts, algebra, geometry and fractions. The Sensorial materials are referred to as ‘materialized abstractions’. Abstract concepts, such as length, volume, depth, etc., are difficult for a child to grasp. The Sensorial materials take one quality, isolate that one quality and embody it in concrete materials which the child can manipulate. The children explore the world’s geography, peoples and customs through materials such as puzzle maps, atlases, flags, land and water forms, and books. Art and music are integrated into daily classroom activities with drawing and painting, singing, listening to music and dance. Our children also receive weekly Musikgarten classes which are run by Brenda Carpentier. A major benefit of the Montessori classroom is the fact that there is a three-year age mix. This age mix helps to foster a sense of responsibility by encouraging the older children to help the younger ones. It also allows the younger children to observe the more advanced work of the older ones. This helps to develop care and respect through helping and sharing with one another. The use of the materials is based on the young child’s unique aptitude for learning which Dr. Montessori identified as the “absorbent mind.” In her writings she frequently compared the young mind to a sponge. It literally absorbs information from the environment. The process is particularly evident in the way in which a two-year-old learns his native language, without formal instruction and without the conscious, tedious effort which an adult must make to master a foreign tongue. Acquiring information in this way is a natural and delightful activity for the young child, who employs all his senses to investigate his interesting surroundings. Since the child retains this ability to learn by absorbing until she is almost seven years old, Dr. Montessori reasoned that her experience could be enriched by a classroom where she could handle materials which would demonstrate basic educational information to her. Almost a hundred years of experience have proved her theory that a young child can learn to read, write and calculate in the same natural way that he learns to walk and talk. 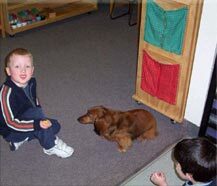 In a Montessori classroom the equipment invites children to do this at their own periods of interest and readiness. Dr. Montessori always emphasized the “the hand is the instrument of the mind.” In order to learn there must be concentration and the best way a child can concentrate is by fixing his attention on some task he is performing with his hands. (The adult habit of doodling is a remnant of this practice.) 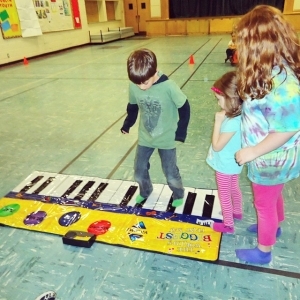 All the equipment in a Montessori classroom allows children to reinforce their casual impressions by inviting them to use their hands for learning. Like Dr. Montessori, Dr. Bloom believes that the environment will have maximum impact on a specific trait during that trait’s period of most rapid growth. As an extreme example, a starvation diet would not affect the height of an eighteen-year-old, but could severely retard the growth of a one-year-old baby. Since eighty percent of the child’s mental development takes place before he is eight years old, the importance of favourable conditions during these years can hardly be over emphasized. Dr. Maria Montessori believed that no human being is educated by another person. He must do it for himself or it will never be done. A truly educated individual continues learning long after the hours and years she spends in the classroom because she is motivated from within by a natural curiosity and love for knowledge. Dr. Montessori felt that the goal of early childhood education should not be to fill the child with facts from a pre-selected course of studies, but rather to cultivate his own natural desire to learn. In the Montessori classroom this objective is approached in two ways: first, by allowing each child to experience the excitement of learning by his own choice rather than by being forced; and, second, by helping him to perfect all his natural tools for learning, so that his ability will be at a maximum for future learning situations. The Montessori materials have this dual long-range purpose in addition to their immediate purpose of giving specific information to the child. The Montessori Teacher acts as a guide and directs the children towards purposeful activities, which are appropriate for their age and level of ability. She is there to help the children and to remove obstacles from their path to independence. She will offer neither criticism nor undue praise but be constantly available when help is required. After a careful presentation of an age-appropriate exercise by the Teacher, the child is free to explore and to choose the materials he wants to work with. Each child is allowed to progress at his or her own pace without undue interference on the part of a teacher. Many of the materials are self-correcting – this reduces the need for children to seek adult assistance and allows them to work independently. This inherent control of error also encourages children to look at mistakes as welcome opportunities for improvement. Exercises can be repeated as many times as desired until the child is satisfied. 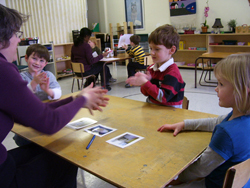 A large part of a Montessori teacher’s training is dedicated to developing the skill of objective observation. You will often see a teacher in the classroom sitting quietly in a corner discreetly observing the children and maybe jotting down notes. Through her observation the teacher can get an insight into a child’s personality, preferences, learning style, level of ability and social skills. She can then tailor her approach to suit each child’s individual needs when she is working one-on-one with them. Through observation the Teacher can also assess when a child has mastered one particular skill and is ready to move on to another challenge. 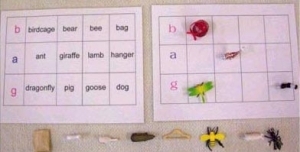 She will then introduce the subsequent exercise and then the child is free to explore the new materials independently. Maria Montessori was born in 1870 in Ancona, Italy. Her parents moved the family to Rome when she was twelve in order that she could get a better education.Maria Montessori declined the usual profession for women at that time, teaching, in favour of studying what were then considered typically male subjects, i.e., math, engineering and biology.She finally applied for entrance to medical school at the University of Rome and was refused because she was a woman.She persisted until she was finally accepted. Since her father disapproved of her chosen profession, she had to finance herself through school with money from scholarships and tutoring. In 1896 Maria Montessori became the first woman to graduate from the University of Rome Medical School. She then joined the staff of the University in the Psychiatric Clinic where she worked with mentally retarded children in the insane asylums of Rome. This sparked her interest in the field and, after studying the works of two earlier pioneers, Jean Itard and Edouard Seguin, she was asked to set up a school in Rome for mentally retarded children. She worked with these children intensively for two years. She was so successful in teaching these children to read and write that they were able to pass the examination at a public school along with ?normal? children. This was a startling revelation to Maria Montessori, not only because of the success of her mentally challenged children, but also because she wondered why the training of normal, happy, healthy children in the public schools was so poor that they could be matched in intelligence by her children. She wondered what would happen if these normal children were given the opportunities offered by her method of teaching. This was a crucial point in Maria Montessori’s career; this is what led her to make the education of children her life’s work. In order to prepare herself as an educator, she then returned to University to study anthropology, philosophy and psychology. During this same period she did a study on the nervous diseases of children, taught at the Women’s Training College in Rome, practised in local clinics and hospitals, and carried on a private practice of her own. In 1904 she was appointed to the position of Professor of Anthropology at the University. Three years later she was asked to take over a Day Care Centre in a slum area of Rome which housed immigrant workers. She saw this as her first real opportunity to put her ideas into effect with normal children. There were approximately sixty children between the ages of three and seven years, all of them poor and underprivileged, with illiterate parents. Dr. Montessori acted as supervisor and hired a girl to do the teaching. The school was a large, bare room with a few toys and some child-sized furniture. The girl she hired was poorly educated and had no training as a teacher, except that Maria Montessori showed her how to present the sensorial apparatus that she had already developed. Dr. Montessori spent the next few years observing, studying, devising materials, writing and revising her findings. She opened several other schools in Italy to study more children in different settings. The children responded so well to her teachings that her work attracted much publicity and, by 1909, there were Montessori schools all over Italy and Switzerland. In 1909 she also completed her first book, The Montessori Method. 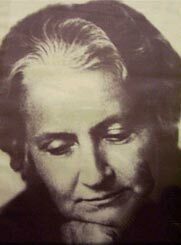 Dr. Montessori was the first to identify, in children from birth to about six years of age, what she refers to as “sensitive periods”. These sensitive periods are now universally recognized in the field of psychology as transitory blocks of time during which children are passionately engaged in particular aspects of the environment to which they direct themselves and which allow them to acquire a certain skill or capacity. During these sensitive periods children learn quickly and with little or no effort on their part. This period belongs in children in their first phase of development, from birth to about six years of age. However, the sensitive periods are limited in time and will pass, never to return, whether or not the function was established. The Montessori environment is designed to meet the needs of these specific sensitive periods so that children are able to reach their full potential in each area of their development. She also observed that children, in their process of adapting to the world, have an inherent urge to learn and to master the skills required to function in their environment. They absorb everything that surrounds them and use this information in the process of building their personalities. The quality of what they receive is dependent on the quality of the various Xaspects of that environment. 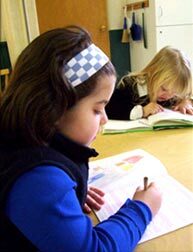 Dr. Montessori therefore prepared an enriched environment and specialized materials which meet the needs of children during all phases of their development: intellectually, socially and physically. In 1912 she made her first visit to the United States and received a tremendous welcome. Her success in the United States was short-lived, due mainly to a critical book published by a professor at Columbia University which was widely read by teaching professionals. In Europe, however, her work flourished and in 1922 she was made Inspector of Schools for the whole of Italy. The Fascist regime of the time in Italy had control of the public school system and then tried to take control of her schools. She held out as long as she could, but was forced to leave Italy and moved to Barcelona, Spain. When the Spanish Civil War broke out in 1936 she moved to the Netherlands, where she remained until her death in 1952, except for a short period in 1939 when she set up a training school in India. By the time of her death, Maria Montessori had received many honorary degrees and tributes worldwide. In the mid-fifties the Montessori Method experienced resurgence in the United States. By that time the Dewey philosophy of education, which had been so predominant in the first half of the century, was falling out of favour as Americans realized they were getting poor results from the schools. Evidence was mounting from educational experts and psychologists such as Freud and Piaget that early learning was crucial to later development. These factors led to an enthusiastic revival of the Montessori Method in North America as people sought for better, more productive methods of education. 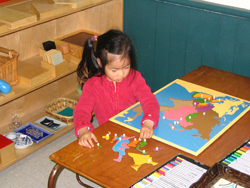 There are now more than a thousand Montessori schools in the United States and Canada.